A primary school designed by leading architectural practice Keppie has won ‘Education Building of the Year’ at the 2014 SCALA (Society for Construction and Architecture in Local Authorities) Awards, beating off competition from around 70 other education projects from 40 local authorities around the UK. 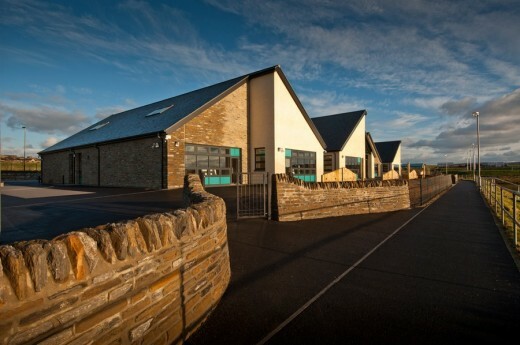 Forming part of the £58 million Orkney Islands Schools Investment Programme, Stromness Primary School in Orkney was designed by Keppie and built by Morrison Construction. The new school provides modern and sustainable learning facilities for 200 school children and 30 nursery pupils in a linked building. The judges noted the building was seen to exhibit “depth of design and management skills” to create a “stylish and practical” solution. The school’s appearance is a contemporary reflection of the traditional Stromness landscape and is achieved by arranging a series of gable ends facing towards Hamnavoe. The project team were also able to use locally sourced materials in a nod to the school’s roots and to ensure an ‘Orkney feel’ was created. The new school, which extends to 2,460 sq m, achieves an ‘Excellent’ BREEAM rating, accomplished through incorporating renewable energy, natural ventilation, natural daylight, a reduced solar glare, improved bio-diversity and green travel arrangements for staff and pupils. It is located on a brownfield site to the north of Stromness with outstanding views over Hamnavoe. The SCALA Awards aim to “inspire and promote the high quality of work carried out in the public sector”, honouring excellence in design and construction. Peter Moran, director at Keppie Design, which also provided landscape and interior design services for the project, commented on the win: “It is fantastic to get this recognition from SCALA. It is a well-respected award, which demonstrates that our scheme showcases the very best of design in the public sector, and is testament to the efforts of the team. “One of the main design features of the new school that was noted by the judges was the physical linking of the nursery to the primary school and the incorporation of internal breakout spaces that can be utilised by surrounding classrooms, increasing their flexibility. 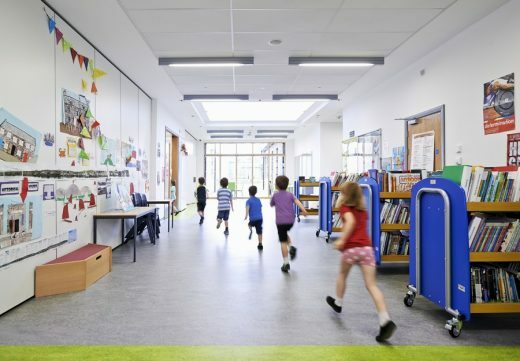 “We designed the break-out spaces and activity areas to maximise flexibility whilst minimising corridors and allowing for varying sizes of activities. The teaching clusters, nursery and administrative areas were carefully planned so they can be closed off from the multi-purpose hall, dining and associated facilities to provide an independent community use facility in the evenings. The school was also shortlisted for the ‘Civic Building of the Year Award’, which is one of the most coveted building design awards in the public sector. Leading architectural practice Keppie Design and Morrison Construction have completed and handed over Stromness Primary School in Orkney as part of the Orkney Islands Schools Investment Programme. Designed by Keppie and built by Morrison Construction, Stromness Primary School will provide modern and sustainable learning facilities for 200 pupils and also includes a 30-pupil nursery and community resource. The school’s appearance is intended to be a contemporary interpretation of the traditional Stromness vernacular and is achieved by arranging a series of gable ends facing towards Hamnavoe. The project team were also able to use locally sourced materials in a nod to the school’s roots and to ensure an ‘Orkney feel’ was created. Peter Moran, director at Keppie Design, which also provided landscape and interior design services for the project, commented: “One of the main design features of the new facility is the physical linking of the nursery to the primary school and the incorporation of internal breakout spaces that can be utilised by surrounding classrooms, increasing their flexibility. “We designed the break-out spaces and activity areas to maximise movement and allow for varying sizes of activities. The teaching clusters, nursery and administrative areas were carefully planned so they can be closed off from the multi-purpose hall, dining and associated facilities to provide an independent community use facility in the evenings. As part of the Orkney Islands Schools Investment Programme, a number of new facilities are being created in addition to Stromness Primary School. These include a new Kirkwall Grammar School complete with a community arts theatre, a new Papdale Halls of Residence providing residential accommodation for pupils who travel from remote islands to attend the school, and a new swimming pool, squash courts and all-weather pitches at the Pickaquoy Centre in Kirkwall.